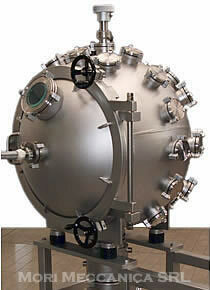 Among the products developed and manufactured by Mori workshops Mechanical Ltd, are in the catalog from EMPTY ROOMS, ULTRA HIGH VACUUM any size or shape, standard and special fittings, valves, flanges. Components and Conflat PNEUROP. The materials used for construction of the rooms are AISI 304, AISI 304L, AISI 316L, where there are no special customer requirements. The products are accompanied by a certified and testing are provided on request and the procedures for welding, cleaning, leak detection. Our ability to develop effective solutions to the most difficult welding problems allows us to provide very unique and reliable products.